Gina Haspel, nominated by President Donald Trump to lead the CIA, is a black ops veteran who once ran a secret interrogation operation in Thailand accused of torturing detainees. If approved by the Senate, Haspel would be the first woman ever to run the Central Intelligence Agency. Despite a controversial past, her rise is not surprising-she previously served as CIA deputy director and led worldwide undercover spying operations, a CIA mission that has gained renewed importance in recent years. Haspel, 61, joined the spy agency in 1985 and served as chief of station in several posts around the world. Rising through the ranks, she earned the job of deputy director of the National Clandestine Service, and was finally named to be service director in 2013. But she was quickly replaced after political questions were raised over her role in post-9/11 interrogation operations, which involved methods widely deemed to be torture, such as waterboarding. Her fortunes changed under Trump, who has expressed support for use of torture in interrogations. Mike Pompeo, then the new CIA chief, rejected protests over her background and made Haspel his number two. Her appointment earned the support of numerous former senior US intelligence officials. But the Senate Intelligence Committee's hearing to confirm her for the top CIA post could be rocky. One member, Democratic Senator Ron Wyden, has already said he will oppose her nomination. "Ms Haspel's background makes her unsuitable to serve as CIA director," he said Tuesday. "If Ms Haspel seeks to serve at the highest levels of US intelligence, the government can no longer cover up disturbing facts from her past." 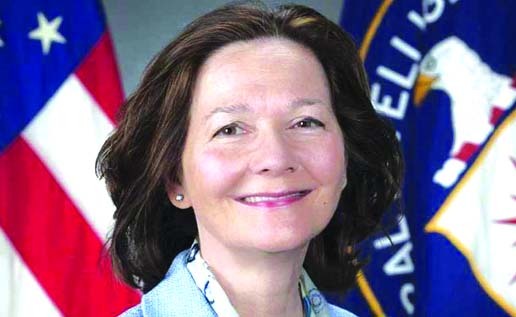 Haspel's public reputation is based on her association with the "black site" prison run by the CIA in Thailand from 2002 for post-9/11 detainees. Media reports said she presided over the torture of key al-Qaeda suspects Abu Zubaydah and Abd al-Rahim al-Nashiri who were interrogated and repeatedly waterboarded at the site. The CIA has always maintained that what it did was legal. "As has been well-documented, the former detention and interrogation program was authorized by President [George W] Bush six days after 9/11, reviewed and determined to be lawful by the Justice Department, and implemented by the CIA," the agency said last year in a statement. Haspel was later accused of the 2005 destruction of the CIA's videotapes of those sessions. Lawyers for Al-Qaeda detainees had sought the tapes for evidence in court cases. She was later cleared of wrongdoing-officials said she had just followed orders in destroying the tapes. Torture has since been explicitly outlawed by the government, and despite Trump's endorsement of it, there have been no reports of the US intelligence agencies returning to the practice. Under Haspel the CIA faces a number of challenges, foremost North Korea. The agency has been behind the curve in assessing what Kim Jong Un is up to, a particular challenge now that Kim has invited Trump for talks on possible denuclearization. The agency also is under constant pressure from Trump to assess Iran's compliance with its nuclear commitments; Trump has repeatedly attacked the nuclear deal and sought evidence to support ending it.